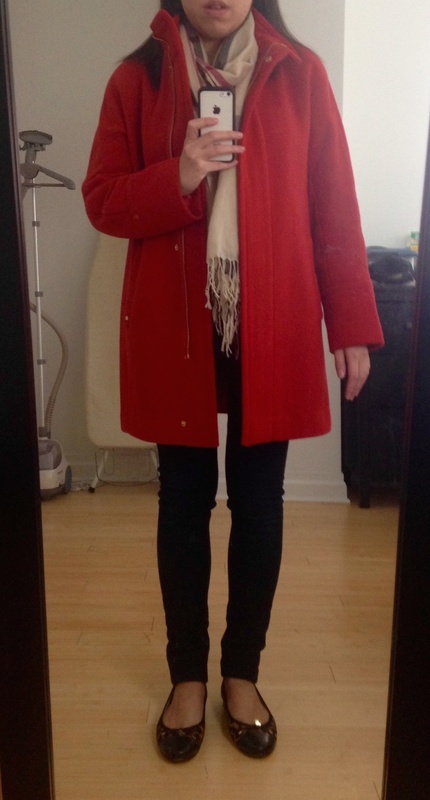 While browsing the post-Christmas sales, I was seized with another one of my sudden impulsive wardrobe desires: I desperately wanted a brightly colored cocoon coat, most likely in orange-red. I might or might not have been strongly influenced by seeing a friend who looked fabulous in a orange-red J. Crew stadium cloth Chateau Parkas. At this point in the season, though, J. Crew was sold out of of pretty much every relevant design and color combination in my size. Furthermore, even with their semi-frequent discounts, their price point was a little high for something that was going to be a major style experiment for me. Both the shape and color are dramatic changes from what I typically look for. I've previously tried on an Aritzia cocoon coat (sold out, pictured) that was a distressingly unflattering look, though a big factor there was that it was meant for someone taller. Orange is also a color I have very little experience with wearing: I did know that coral clothes and lipsticks are not great on me, which potentially made orange-red not too promising, even if the colors are different. Does anyone else sometimes end up buying something because of direct inspiration from seeing a friend wear an extremely similar item, by the way? I've done so a few times and it makes me worry just a little that it'd be construed as slightly creepy. It only means that I think the person in question has excellent taste and looks fabulous in the item in question, but I suppose I'm a born worrier. My shopping process came down to two choices: the Ellen Tracy coat I got and a Kenneth Cole design with a bigger discount but slightly busier design that didn't fit with the image of a simpler cocoon coat that I had in mind. 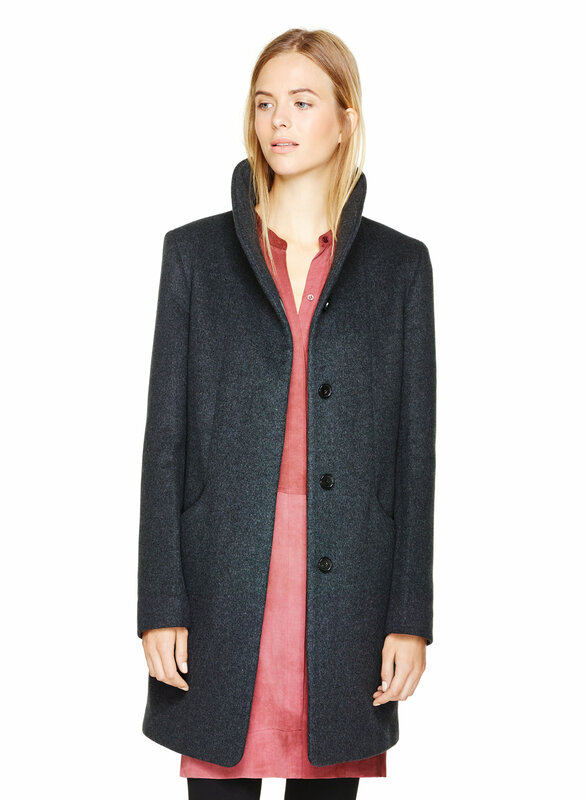 The Ellen Tracy coat is probably not perfect: the quality is maybe not the best as the wool blend feels a little bit scratchy, though that doesn't affect the wearer because of the lining. Still, the price and the design are right, and as with the rest of my purchases, I plan to take good care of it. It should last me at least a good two to three years, and probably longer, with occasional wear from fall to spring, barring any dramatic changes in my size. Size and fit-wise, this coat runs large, particularly around the chest and stomach, and maybe a little long, and not all of that is accounted for by how cocoon coats typically run a bit oversized. 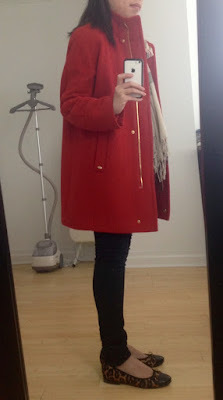 Most of my other coats are regular sizing, which is typically fine despite my 5'3'' height and short legs, and I'd typically expect the size 6P I'm wearing above to be a bit small in the chest. Here, the 6P is a bit roomy, though I like my coats to have room for thick sweaters and giant scarves and I do think the cocoon coat look requires the coat to be a touch oversized.